They cut through the winter confusion to see what's actually present. Ask people in chillier climates if they're looking forward to self-driving cars and they'll probably just laugh. The technology has an easy time in ever-pleasant locales like California, but snow is a nightmare that obscures lanes, cars and entire roads. Waymo knows how to tackle that problem, though. 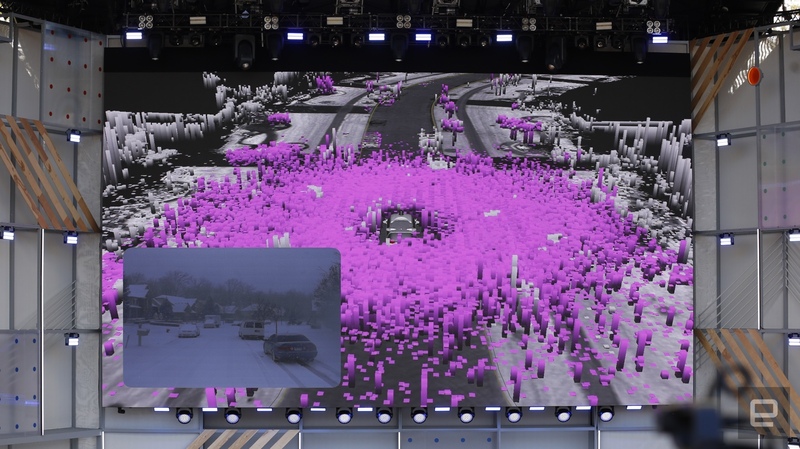 In a presentation at the Google I/O keynote, the company visualized how its vehicles safely navigate a winter wonderland. Snowfall (and rainfall, for that matter) ultimately amounts to sensor noise -- that's the sea of purple in the image above. Waymo uses machine learning to filter out the snow and see just what's on the road, even if there are vehicles parked by the curb. It's not clear whether the car can distinguish lanes, but this would at least be enough to avoid collisions and get you home safely. This technology, combined with work on navigating unmapped roads, should be critical to making self-driving cars widely available. Miserable weather and barely visible roadways are common in many parts of the world, and they're not about to go away just because they're inconvenient for autonomous vehicles. Click here to catch up on the latest news from Google I/O 2018! Jon has been hooked on tech ever since he tried a Compaq PC clone when he was five. He's big on mobile and is one of those precious few people who wears his smartwatch with pride. He's also an unapologetic Canadian: Don't be surprised if you get an earful about poutine or the headaches with Canadian carriers.